Many manufacturers struggle to link strategy with operations, and as a result, great plans often remain just that – plans - and not great products. Yet a few standout companies find a way to cross this divide and create robust and regular pipelines of successful products. By studying the traits of these winners, PTC has created the PTC Value Roadmap - a unique tool to help manufacturers find and unlock the value within product development. 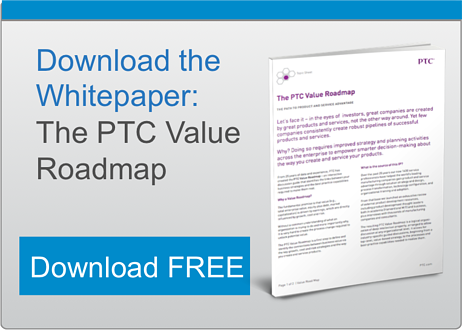 The PTC Value Roadmap helps senior executives make their corporate strategies operational by linking them to improvements in product development processes with a simplicity and clarity that did not previously exist in the industry. It also helps functional owners do a better job of internally selling technology funding and process improvement initiatives. Contact us today for your free Value Roadmap Consultation. More than 40 interviews conducted with executives in leading manufacturing companies. The fundamental premise of the Value Roadmap is that there is a linkage between corporate strategy, operations, and required capabilities.